See the sights of downtown Nashville on a 20-minute carriage ride along Lower Broadway that takes you past honky tonk hotspots in the country music capital of the world. You’ll see historic landmarks and renowned Nashville establishments frequented by music legends from Loretta Lynn to Alan Jackson. The white stretch carriage is pulled by two horses and accommodates eight passengers. Choose from multiple departure times throughout the day. 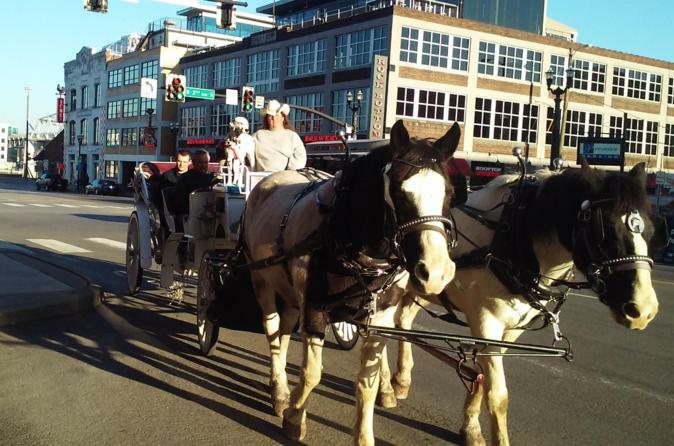 Hop aboard your horse-drawn carriage in downtown Nashville for your 20-minute tour along Lower Broadway, home to many of the music venues and other sites that give Nashville its 'Music City' nickname. As the horses clip-clop down the street, see the 3-story restaurant and live-music venue Honky Tonk Central, and spot Tootsie's Orchid Lounge, another well-known honky tonk bar. Pass by Merchant’s Hotel, where notable Nashville legends including Loretta Lynn, Hank Williams, Patsy Cline and Dolly Parton have stayed, and see Bailey’s Sports Grille, a social gathering place where Loretta Lynn was discovered. After riding above the underground tunnel near Nashville’s Music City Center and passing the John Seigenthaler Pedestrian Bridge (formerly the Shelby Street Pedestrian Bridge), catch a glimpse of Cumberland Park along Nashville’s riverfront and the Tennessee State Capitol, a National Historic Landmark. Other honky tonk highlights include: Acme Feed and Seed, a restaurant and performance venue featuring music greats like Alan Jackson; the Country Music Hall of Fame and Museum, with exhibits on music greats such as Kenny Rogers, Tanya Tucker and Bob Dylan; the War Memorial Auditorium, a concert hall built in 1925; and the Tennessee Performing Arts Center, or TPAC, which includes several performance venues that feature ballet, opera, repertory theater and Broadway shows. Once you've been introduced to these attractions on your carriage tour, you'll be returned to your starting point so you can visit what you like on your own.